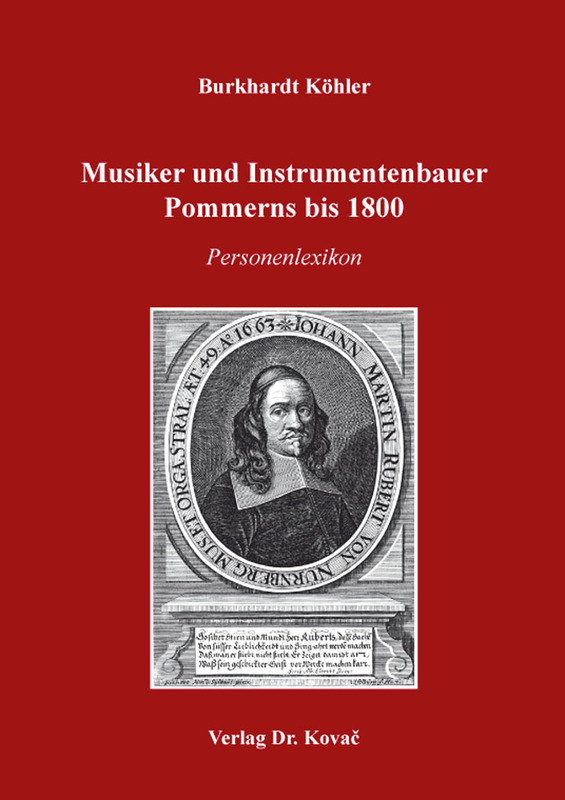 Musiker und Instrumentenbauer Pommerns bis 1800. Veröffentlichung (english) von Burkhardt Köhler, Verlag Dr. Kovač 2019, 278 S.
This lexicon contains 2600 names: Musicians, instrument makers, but also bell founders and dancing teachers.The book is limited to the period up until 1800: This is primarily because after the Thirty Years’ War, the music of the former duchy (now dominated by Sweden and/or Prussia) is losing its typical Pomeranian character, with both protestant church music and musicians’ guilds gradually vanishing. The formerly artistically ambitious position of organist is atrophying. On the other hand, one is anxious to preserve valuable organ substance. These and other tendencies of Pomeranian music culture become clear through the outlined curricula vitae of important personalities.